When I set out to make a new cookie, it’s never an easy task. SO many recipes touted as “the best”, so little time. And so few calories to sacrifice. But I’ve had my eye on these giant double chocolate cookies for almost exactly a year now and I finally gave in. It was time to tackle a giant cookie and I was ready for it. The long-awaited verdict? An extra half hour on the treadmill was well worth the work for these cookies. 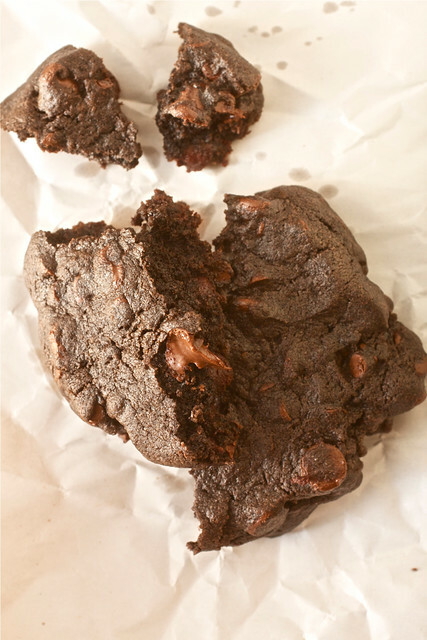 Dense, chocolatey, and gigantic, these cookies are best served slightly warm to take advantage of the gooey chocolate chips. I feel like they could have been just slightly sweeter since the dark cocoa powder (I used Hershey’s Dark) really takes center stage and is altogether unsweetened to begin with; I’ve adjusted the recipe below to reflect this. Whether you weigh the dough into 4oz portions (this will yield 11 cookies) or divide the dough manually into 12 cookies, be prepared for a decadent bakery-sized cookie. 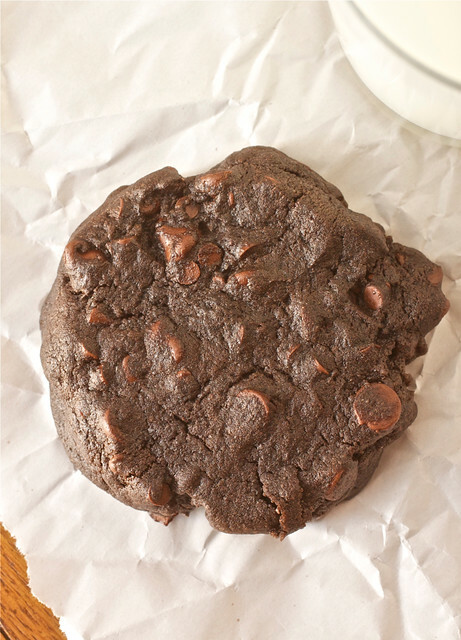 I’ve never had cookies from Levain Bakery in NYC but if this cookie is any indication of what they are like, other copycat recipes that are floating around the web may just be in my future as well. In the bowl of an electric mixer fitted with the paddle attachment, beat the butter and sugar together on medium-high speed until light and fluffy, 2-3 minutes. Blend in the eggs one at a time, scraping down the bowl as needed. On low speed, stir in the cocoa powder until well blended. Add the flour, salt and baking powder to the bowl and mix on low speed just until incorporated. Fold in the chocolate chips with a spatula. Transfer the dough to a work surface and with slightly damp hands to prevent sticking, knead briefly by hand to be sure the ingredients are well combined. Divide the dough into 4 ounce portions (yields 11 cookies) or divide into 12 equal pieces. Again with slightly damp hands, roll each portion of dough into a ball and flatten just slightly into a disc. Place on the prepared baking sheets, two inches apart. Bake 16-20 minutes, until you’re just able to lift the edges up off the pan without breaking the dough. Let cool on the baking sheets 5-10 minutes, then transfer to a wire rack to cool completely. Oh my! I bet these rocked your socks right out of the oven! Love these! oh wow, these look so indulgent! Levain cookies are seriously amazing, especially when warm! I have their choc chip cookie recipe if you want it! Can you send me that chocolate chip recipe? jmbh – I am a huge Levain cookies fan. Can you send me that chocolate chip recipe? These really do look worth an extra workout! This Levain knock-off has made the blog rounds and for good reason! They are a spectacular cookie and taste spectacularly good! I’m looking forward to making the Levain knock-off for regular (if that term even applies!) chocolate chip cookies. Anyway, definitely worth every calorie and every extra minute exercising! Oh, how I love these cookies. I normally keep some of the dough balls in the freezer but I’m out at the moment. You just inspired me to replenish that supply! I’m making these tonight for a friend who did a huge favor for me. I think these will be the perfect way to thank him! These cookies are so good! I’ve made them many times. Since I’m having company over this weekend, it is the perfect time to cook them up. This way I won’t eat them all! I will give to Tara and then she can share!! I’ve actually not made it yet. Got it from a friend at the FCI I couple of years ago. . . .we’ll see how it works. I made these, and they’re fantastic! I do feel like they could use some more salt though – I sprinkled some on top of the 2nd pan that I made, and the extra salt really made the chocolate pop more. I didn’t expect this recipe to be as fluffy as it was, and they were delicious! I omitted your extra 2 Tbsp of sugar because I didn’t understand the recipe sufficiently before starting. You were exacty right to include it. Without those 2 Tbsp, the cookies need just a smidgen more sweetness. I agree with another commenter that it could use a little more salt to make the chocolate flavor pop. They’re very good as it, and more salt just might make them fantastic.